Back in 2010 when I suddenly, and very unexpectedly discovered that I was pregnant, my world turned on it's head. It was a whirling and swirling state of affairs. I was scared, and in honesty I was so far past scared that I was absolutely terrified about all that was now to come. The toll that the next 9 months were going to take on my body, and how would I even begin to handle an actual real life baby? Through the initial shock though, I found my way out of the other side and I began to get excited. I started to shop for everything that my baby was going to need, and my partner? He decide to purchase a special treat for himself. Something he had always wanted. 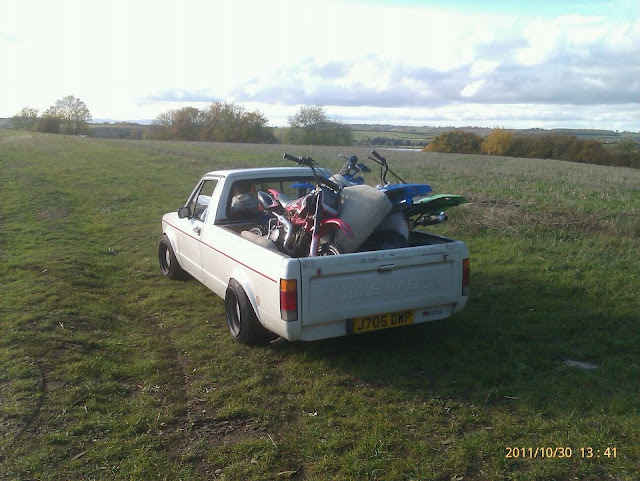 A VW Caddy Pick Up. It was something that later became to be known as his mid life crisis, and when he announced his intentions I took a side step and let him throw himself into the hustle and bustle of finding the perfect pick up, because deep down I knew that this has been a life long dream of his, and I also knew that while he was busy car hunting...I could be busy shopping for our little one's arrival. Of course it didn't actually work out that way, and I spent quite a lot of time heading up and down the country with him on the hunt for his new car. As the weeks went by, the bigger I got and the more determined he became in finding this car. People thought it was madness, because by getting rid of his nice sensible 5 seater car, and downgrading to a Caddy with 2 seats and absolutely no room for a baby... the idea did seem a little bit crazy. It wasn't completely preposterous though, being a driver myself and at the time having a 5 seater car of my own, it just meant that any family trips would have to be planned in my car, and getting Luke insured on that eliminated me having to drive all of the time. He hunted online car sales sites, wanted ads and Parkway Contacts who are a Volkswagen retailer, before he eventually found exactly what he was looking for not to far away from home. I can still remember going along and viewing it with him, I was pretty far along by this point and if memory serves, I believe it was only a couple of months before Leo's arrival into the world. It was love at first sight, and I knew that we wouldn't be leaving without this car. I was right, and within that week Luke had his car. He finally had his car home and he really was like a child at Christmas. When it came to going anywhere over the next couple of months, he was always more than happy to drive, and it was on a family holiday to Cornwall at almost 36 weeks pregnant I discovered how Caddy's were not the most comfortable of cars to fit a huge tummy into, and 4 hours later when we finally arrived at the holiday home, my back was in need of a generous stretch. Looking back I can't help but chuckle, of all the things we could have been doing in those months on the run up to Leo's arrival... Buying a new car was not something I anticipated doing. Does where you live effect your health?